This is not a hair product review, but I kinda sorta have to do this. 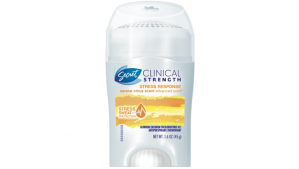 I recently tried out the Secret Clinical Strength Stress Response Deodorant that I received from Influenster , and I'm here to share it with you! Quick information about influenster, they are a company sends you new products from companies in order for the company to get a consumer reviews and make their product release popular. Well that is my own summary for what influenster is at least. All in all, they are a great company and send out good Voxboxes. Product Claims: Secret Clinical Strength Stress Response fights all three causes of sweat – including the worst smelling cause, stress sweat • Secret’s studies show women can sweat on average 30 times more when stressed than normal. Keeps your pits dry for the most part, even during workouts! Final Verdict: I personally would never purchase this product, I would rather use my regular deodorant and body spritz, although it does what it claims, I just can't risk having irritated skin and getting breast cancer.